As a mother we spend a lot of time in the kitchen. Every kitchen should have a Nutri Ninja Pro Compact System! It is beyond awesome in so many ways. For a full review click here. This Mother’s Day enter for a chance to win! 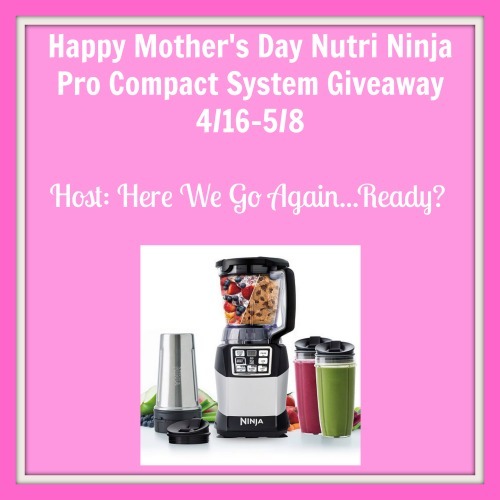 One lucky reader will receive the Nutri Ninja Pro Compact System! This giveaway is US, 18 or older. Only one entrant per household. Giveaway ends on 5/8 11:59 PM EST . Winner will be notified by email and has 24 hours to respond. If there is no response during that time a new winner will be chosen. Good Luck Everyone!!! Here We Go Again Ready is not responsible for prize distribution. The sponsor will distribute the prize. This contest is not associated with Facebook, Twitter, or any other social media. We would make smoothies for the family. So long story short, I’d make coffee with it first. I want to make kale smoothies and cauliflower soup! I would start making smoothies again! I miss them! my banana ice cream…I gave away our blender and now I’ve got nothing but my hand to use and it’s simply not enough me power to make it!